Exceptional screen-true likeness of Ben Affleck as Batman! 1:12 scale action figure based on Batman v Superman: Dawn of Justice. Includes a film-accurate outfit, over 44 points of articulation, interchangeable heads and hands, and an arsenal of Bat-ccessories! The incredible digitally modeled portrait sculpt creates an exceptional screen-true likeness of award-winning actor Ben Affleck as Batman in the blockbuster motion picture Batman v Superman: Dawn of Justice. 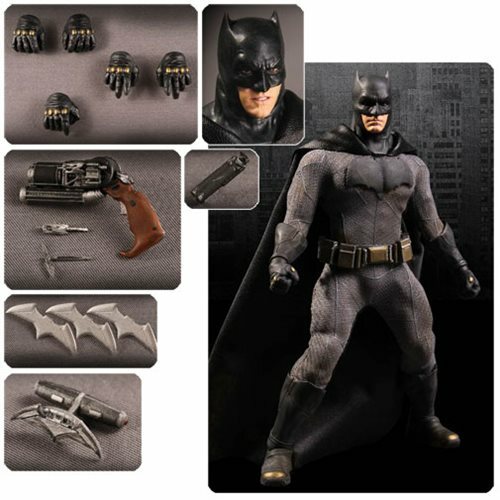 The 1:12 scale Batman v Superman Batman One:12 Collective Action Figure also sports a film-accurate outfit, over 44 points of articulation, interchangeable heads and hands, and an arsenal of Bat-ccessories! For collector convenience, each figure is packaged in a deluxe fifth panel window box with a translucent acetate slipcover that allows for both maximum protection and ease of removal for display. Ages 15 and up. Batman is ready for the unthinkable. Fearing the actions of a god-like superhero left unchecked, Gotham City's own formidable and forceful vigilante takes on Metropolis' most revered and modern-day savior, while the world wrestles with what sort of hero it really needs.